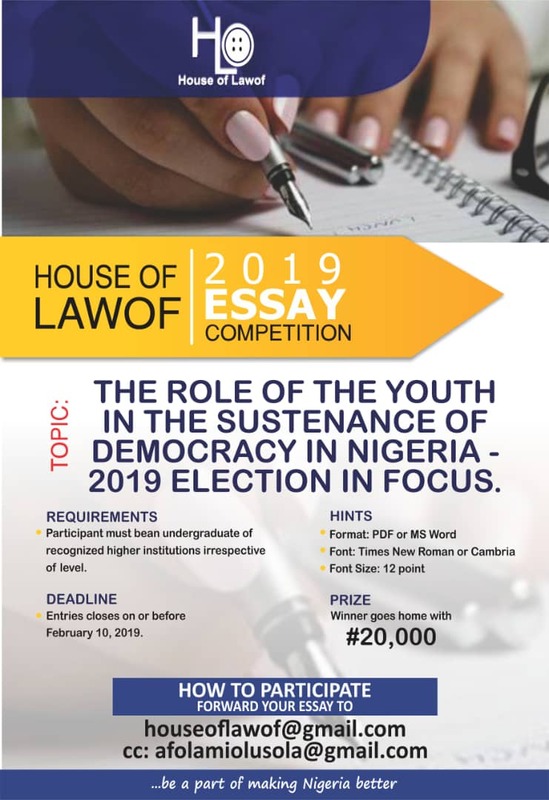 WELCOME TO HOUSE OF LAWOF: House Of Lawof 2019 essay competition. 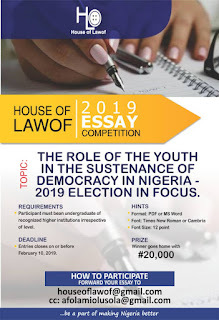 House Of Lawof 2019 essay competition. 2019 HOUSE OF LAWOF ESSAY COMPETION!!! House of Lawof is one of the fastest growing brand names in the fashion industry of Nigeria, focusing on using her platform to empower young Nigerians economically while making positive changes in the society. House of Lawof is kicking off the 2nd edition of it's essay competition that will create the awareness among Nigerian youths on the need for a better Nation. TOPIC: THE ROLE OF THE YOUTH IN THE SUSTENANCE OF DEMOCRACY IN NIGERIA - 2019 ELECTION IN FOCUS. Participants must be undergraduates of recognised Nigerian Higher Institutions irrespective of level. Length: Essay should not be MORE than 2000 words long and double spaced. Bibliography and title page are necessary. Numbering: sequentially numbered pages with one-inch margins excluding title page and bibliography. Student's registration or admission number must appear at the header section of each page. Evidence of admission to the institution or current student ID should be sent together with the essay during submission. Entries closes on or before February 10, 2019. Forward your essay to houseoflawof@gmail.com. The winner of the competition goes home with N20,000 Naira. Be a part of making Nigeria better.